Garage sales for residential properties are typically permitted on the first full weekend of March, June, September, and December each year. 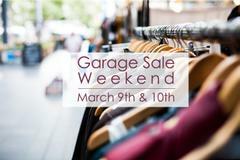 Due to inclement weather, March’s Garage Sale Weekend will be March 9th & 10th. No permit is required. •	Sales may begin at 8:00 a.m. and must end at 5:00 p.m. Persons conducting sales on any unauthorized weekend or violating any of the above regulations will be subject to an Administrative Fine or a misdemeanor citation.